Good morning sports fans. 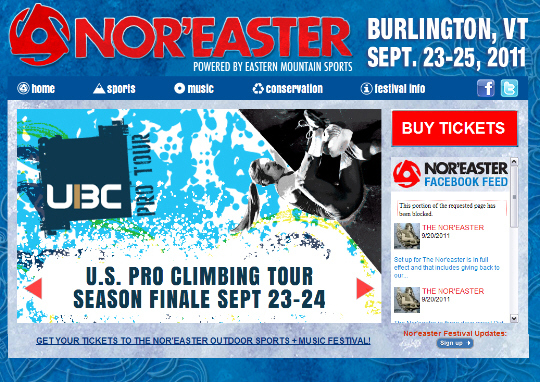 Check back throughout the day as I provide live updates from the grounds of the 2011 Nor’easter and the finale of the Unified Bouldering Championships Pro Tour. The qualifying round of climbing should start around 10:00 AM EST. If there is a climber climbing in qualifiers today that you want me to pay special attention to (pictures, updates, etc. ), just let me know in the comments and I will do my best to keep you up to date on how they are doing. I can’t approve of serving alcohol to athletes?? never been to wisconsin before obviously. my friend dana bleiberg is competing this morning! im at work and i want to know how shes doing! also, is there going to be live feed? – been looking forward to seeing Dave Graham in a boulder comp..
How many comps has he been listed for and then no-showed in the last year? Seems like at least 3. The problem is that sponsors sometimes register athletes into events they aren’t 100% committed to. Not sure if that is the case here but it’s certainly disappointing not to be able to see him climb. I talked to Dave after the comp. He’s still trying to adjust from returning from Australia so he wasn’t quite feeling up to competing today. Nick Picarella climbs out of the Philadelphia Rock Gym…I’ve witnessed this cool/ strong kid send hard. I hope to check him out in finals. Narc, are you unbiased or do you have any heroes you’re rooting for? I wouldn’t mind hearing the inside man’s predictions either! Predictions are a bit hard to make based off qualifiers. The top climbers for the men and women made things look easy, so it was hard to really where they all stood. Obviously Angie and Alex will be hard to beat and for the men Ethan, Paul, Ty and Ayo all looked great. Hopefully semis will be where we start to see some difference. Based on today’s showing Finals should be a real good show. Are you still doing updates? How’s Dan Beall doing? Sorry about that, I had to bail on the updates there. Dan did well on all the problems except M5. I don’t think he sent that. I will make note of that for tomorrow. I’m excited to see Paul stand on top the podium again. it’s been a few years.